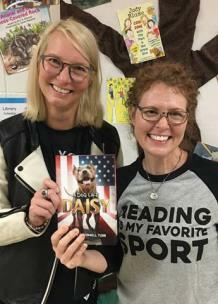 A Dog Like Daisy by Kristen O’Donnell Tubb is the Hamilton book of the week nominated by Debbie Condry, the librarian at McConnell Elementary. Ms. Tubb is a Tennessee author and visited McConnell Elementary’s fourth and fifth-grade students last November. A Dog Like Daisy is a sweet, age-appropriate novel for young students, told from the humorous, thoughtful perspective of a rescued pit bull as she trains to be a service dog for an injured veteran and his family. Daisy struggles with wanting to be able to protect her new family and the fear of failing and being abandoned-again. A Dog Like Daisy teaches kids about loss, love, and perseverance. To see all Hamilton Book of the Week editions, visit https://www.hcde.org/parents___students/suggested_reading. Hamilton Book of the Week seeks to move Hamilton County Schools closer to district goals found in the Future Ready 2023 action plan. We hope to encourage kids to read more books for fun by sharing books popular at area schools.